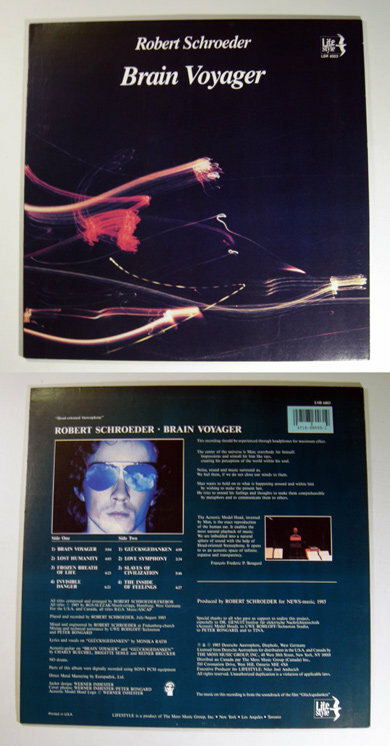 ELECTRONIC - ROBERT SCHROEDER "BRAIN VOYAGER" 1985 LIFESTYLE LP (EXCELLENT CONDITION ORIGINAL CANADIAN PRESSING) - SYMPHONIC ELECTRONIC MUSIC WITH A FEW ACOUSTIC ELEMENTS BY THE MUSICIAN DISCOVERED IN 1978 BY KLAUS SCHULZE. A SOLID ALBUM THAT COMBINES CLASSIC GERMAN ELECTRONIC KRAFTWERK WITH PASTORAL AND EMOTIONAL 'NEW AGE' - MORE DETAILS BELOW... Schroeder, Robert - Brain Voyager (12" 33 LP, Cdn stereo) 1985 Lifestyle / div of Moss Music Group LSR 6003 (includes: Brain Voyager, Lost Humanity, Frozen Breath of Life, Invisible Danger, Glucksgedanken, Love Symphony, Slaves of Civilization, The Inside of Feelings) condition: VG/VG to M- (electronic COVER: slight scuffs/wear at edges of corners, slight rw VINYL:, occ. v. slight surface noise) All SET SALE/BUY IT NOW payments made through PAYPAL to be made no later than 1 week (7 days) from date of purchase. Postage and Packing including heavy cardboard mailer and padding charges are: SHIPPING COST FOR 1x SINGLE LP, EP or 12" SINGLE: is based on the location of the recipient and are the ACTUAL calculated postage packing costs for this item sent via Canada Post small packet service. RATES within CANADA are based on the postal code of recipient. We happily offer combined shipping for those wishing to make multiple purchases! Please contact us for the current Canada Post (p p) rates to your location if you plan to continue buying. Payments accepted through Paypal. Orders shipped following receipt of your payment in full. Notification by e-mail of when item is shipped. Note: Canadian residents also pay the 5% GST while... Ontario residents pay the 13% HST. If you have ANY questions or require ANY sort of clarification or additional information about this item please ask BEFORE purchase. Thanks!